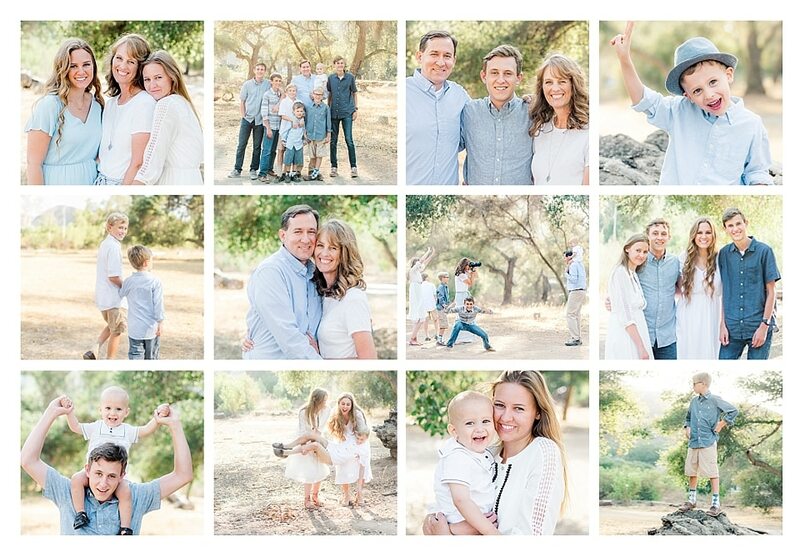 Based in San Elijo Hills, California, I photograph portrait sessions and weddings serving North San Diego County. Outdoor sessions in natural light focus on fun and relationships with vibrant and film inspired photography with clear tones and clean color for a timeless and classic look. I'm a wife and proud momma to a small tribe of 9 sweet and very spirited kids - 2 girls and 7 boys. My photography team consists of usually one assistant shooting with me (carrying your things and getting your kids laughing) and a small team at home holding down the fort. Definitely a family business! My journey into photography began in search of the perfect family photo - learning shooting, lighting, editing, and mastering the occasional head swap in photoshop 😉 As my clients grew up, so did my skills and offerings - we grew to love shooting seniors and now several weddings each year as well! 20, 19, 17, 14, 13, 10, 8, 5 and 2 and girl, boy, girl, boy, boy, boy, boy, boy, boy - yes 6 boys in a row! Ashley wanted a baby sister and got 6 little brothers instead. 7 at home for now, 1 at BYU getting her Masters in Biostats and 1 serving a mission for our church in Rome, Italy and 1 headed to BYU in the fall. Photography is my fun time, along with running with my little guy every morning and spending time serving the ladies in our women's group at church. My tribe and I are so thankful to all of our clients who have supported our little adventure. We look forward to many more years of photographing your awesome families!!! !